* Before IFRS 2 charges and from continuing operations. 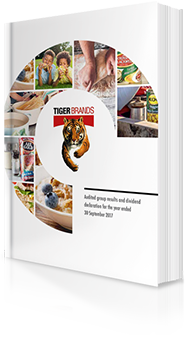 Tiger Brands is reporting a relatively strong set of results driven by revenue growth of 2% to R31,3 billion and 11% operating income growth, before IFRS 2 charges, to R4,6 billion. Operating margins increased by 110 basis points (bps) to 14,8%. This improvement was due to improved pricing strategies enhanced by good procurement and better cost control. Intense competitor pricing activity and declining consumer confidence resulted in volumes declining by 3%. Cash generated from operations is up 43% to R6,1 billion, benefiting from improved working capital management. Headline earnings per share increased by 2% driven by the domestic performance and diluted by a disappointing performance from associates and the Deciduous Fruit business.